Carrie Haddad Gallery is pleased to present “Abstraction”, a group exhibit showcasing abstract art, photography, and sculpture. Paintings by Adam Cohen and Elizabeth Coyne will be on view along with works on paper by Donise English and Chris Duncan. The upstairs gallery will debut the photography of Nick Simpson. On view July 15th through August 23rd, the reception for the artists on will be held on Saturday, July 18th from 6-8pm. All are welcome to attend. 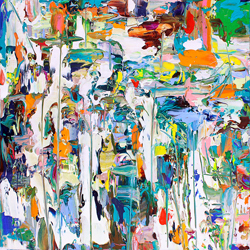 Renowned art critic, Carter Ratcliff, has described the work of gestural abstractionist, Adam Cohen, “like a sudden burst of light. Vision is dazzled by a surface alive with color, swarming with incident.” The front gallery will feature his most recent work which consists of layers of harmoniously bold colors formed intuitively as the artist responds to each stage of the painting. Compared to earlier works, Cohen’s canvases are now characterized by thicker paints that are dabbed, smeared and cut into with a palette knife, the tip of a brush handle, or the head of a nail. The resulting marks, disruptive yet unifying, bind the patches of pigment into a brilliant display of color. Cohen earned his BFA at Philadelphia's Tyler School of Art at Temple University. Adam Cohen exhibits both nationally and abroad. The gallery is pleased to introduce Elizabeth Coyne in her first exhibit in the Hudson Valley. Moving between figuration and narrative abstraction, Coyne creates worlds within her paintings that she describes as “a synthesis of the mind.” Each piece is constructed with a personal visual language invented through images based on the natural world, composed from products of imagination and perception. Delicate lines painted against gradated undertones suggest maps, graphs and symbols. With this, Coyne’s canvases present the viewer with an ethereal environment or a kind of dreamscape that houses its creator’s private cartography. Coyne earned her MFA in Painting from the Rochester Institute of Technology in New York and has studied and lectured at the Art Institute of Chicago. She has been featured in exhibitions in Germany, Canada, New York, Ohio, & Washington, D.C., among other locations. Elizabeth Coyne’s work is collected internationally and has been featured in publications such as Architectural Digest, The Chicago Tribune, The Chicago Reader, and Windy City Times. Donise English introduces a new series of collages on paper and vellum called “What To Do With A Grid”. Each 12 x12 inch collage consists of a grid-like composition that is paired with another piece harmonious in color and form. Together, their geometric patterns make reference to architectural drawings, blueprints, maps, patterns, or various structures. English’s pictorial space within these works on paper is created through a multitude of layers that are a visual and ideological response to the one beneath as they correspond to her preconceived format. Donise received her MFA from Bard College and is currently a Professor of Studio Art at Marist College in Poughkeepsie, NY. There may be no better example of “art as a verb” than the sculpture and drawings of Chris Duncan. Duncan’s sculpture, primarily constructions of heavy steel and scrap metal, vibrate with kinetic energy and seem as though they could burst at any moment. Art critic, fellow artist and teacher Mario Naves describes Duncan’s work as being “peculiarly visceral in character…their [the sculpture’s] growth and metamorphosis occur…right before our eyes”. Duncan also shares a selection of drawings on paper made of charcoal, ink and white acrylic. What originally began as a functional stage, a sketch to represent three-dimensional structures with a two-dimensional medium, eventually became something unique unto itself. Drawing allows Duncan to indulge in the immediacy of the present, finding a harmonious balance of weight, line and color with an entirely separate set of materials. The works on paper are anything but static, or as Naves writes, “[Duncan] creates a vortex of rhythm as rambunctious as a prime Warner Brothers’ cartoon.” Chris Duncan has exhibited his work most extensively in galleries and universities in New York State since 1990. He is the Baker Professor of Visual Arts at Union College and a former Guggenheim fellow. The upstairs photo gallery will unveil a new series of photographs by London based artist, Nick Simpson. The Bumforth Manor Collection consists of a series of archival prints inspired by a mythical story concerning a quantity of glass photographic plates discovered in an old oak chest on the Bumforth Manor estate in rural England, the family home of the Gascoigne-Simpson's for over nine generations. These plates, which had lay gathering dust for over a hundred years, were supposedly the work of Simpson’s great grandfather, Samuel Heracles Gascoigne-Simpson, a disciple of William Henry Fox Talbot, commonly considered to be the father of photography. To bring this story to life, Simpson starts by building a set, authentically mailto:carriehaddadgallery@verizon.net">carriehaddadgallery@verizon.net.